on and the Green Valley Hospital, filed an amicus brief in support of a group of Arizona legislators who are challenging the imposition of a hospital tax to pay for state Medicaid expansion. The charge at issue, which was passed by a simple majority of the Arizona legislature, requires hospitals to pay an “assessment” on hospital revenues, discharges, and bed days. In some cases, like with Green Valley Hospital, a hospital will be required to pay hundreds of thousands of dollars to the state while receiving nothing in exchange for the payment. That fact indicates that the charge is a tax, rather than an assessment or a fee. 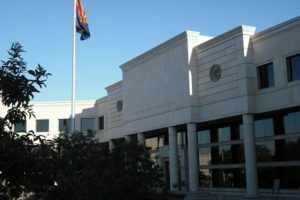 The legislators recognized this and challenged the hospital assessment as violating Article IX Section 22 of the Arizona Constitution, which requires a 2/3 vote before the state legislature can impose any new taxes. The lower courts, however, narrowly defined the word “tax” and held that the hospital charge was an assessment that is not subject to the supermajority requirement. A narrow reading of Article IX, Section 22 is contrary to the voters’ intent in adopting the provision. In 1992, Arizona residents faced some of the highest tax rates in the nation. In response, they sought to limit the legislature’s power to raise taxes and amended the state constitution. Arizona’s tax situation in the early 90s was very similar to the tax situation in California in the 1970s. In 1978, California residents faced ever increasing property taxes, and responded by limiting the authorities of local governments to impose property tax increases. Unfortunately, local governments ignored the will of the voters and started imposing tax-like fees and assessments in order to get around the limitations. This tactic was endorsed by the California courts. In response, California voters passed new limitations on state and local taxing authorities. But once again, government officials and courts ignored voter intent and California voters had to pass even more initiatives. This back-and-forth not only fostered resentment in California voters, it created a more complex legal regime for distinguishing between taxes and non-taxes. As PLF, HJTA, and Green Valley Hospital argue in their amicus brief, the Arizona Supreme Court can avoid what happened in California. Instead of creating numerous exceptions to the taxing limitations in the Arizona Constitution, the court should respect the will of the voters and define tax narrowly. Hopefully the court will grant the legislators’ petition for review and ensure a proper interpretation of Article IX Section 22.